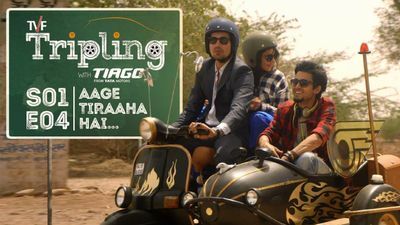 Here's where to watch every episode of TVF Tripling season 1. Mouseover or tap an episode to see where to stream it. Click or tap the play icon to stream it on the best available service. Toh Chalein...? Aug 28, 2016 Chandan, recently divorced, returns to Mumbai to meet his brother, Chitvan, a DJ. Chitvan, running from debt collectors, drags him to Jodhpur, to meet their sister, Chanchal, who is married into a royal family and pregnant. Ab Kidhar...? Sep 4, 2016 Chanchal reveals to her siblings that she is not actually pregnant. Following the fight between the siblings and Chanchal's husband, Rahul, they unceremoniously leave the palace. Right, left ya seedha...? Sep 11, 2016 Chandan, Chanchal and Chitvan leave Jodhpur to hit the road. On their journey they find themselves lost in the desert. They meet a group of Israeli girls who steal their car. Pahunch Gaye Kya...? Oct 2, 2016 They've gone their own ways, taken their own paths. But this road trip of a lifetime has only one destination. Home.